@ENBSports (Aaron Nielsen): RNO: Is there a better option for MLS than the Designated Player? RNO: Is there a better option for MLS than the Designated Player? Being a Canadian MLS fan, especially seeing the success of Marco Di Vaio in Montreal and rumors of big name players coming to Toronto, it might not be best to suggest an alternative to the current MLS Designated Player and off-budget player designations. In analyzing my most recent article in solving the player value puzzle and capology in MLS, I think a solution that would work better than the current Designated Player and Generation Adidas system is having salary cap relief for American and Canadian internationals on your team. It could easily be argued that David Beckham increased attendance in MLS and made money for the league, while current players such as Robbie Keane and Thierry Henry have some influence as well. However, if you go through the historic list of DP's in the league you could also argue that these players have actually lost the league money and haven't provided it with any long term benefits. Sure their quality and/or offensive output is better than your average player, but in the case of players such as Kenny Miller, Danny Koevermans, and Obafemi Martins, these players are making 10 times the average MLS salary, while the list the most recent ex-DP's Kris Boyd, Hamdi Salihi, Barry Robson, Sherjill MacDonald and Christian Tiffert demonstrates the issues MLS management has had in finding significant team improving talent, even when salary isn't an issue. The issue under the current system is the league is rewarding players and making player recruitment decisions on potential, opposed to rewarding players for their success in the league. 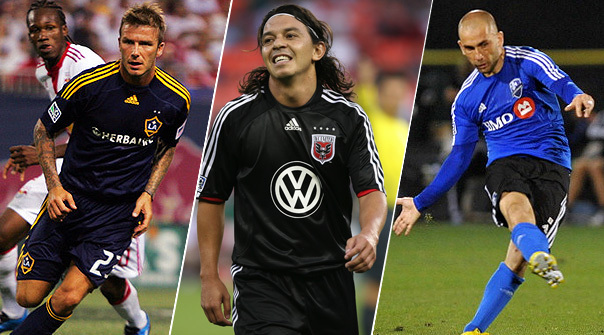 MLS has tried to rectify this recently by giving DP contracts to Chris Wondolowski and Omar Gonzalez, however, these players have earned this on past performance and will only be regarded as good contracts if they can maintain the same output as the past. These domestic DP signings have also created a new precedent and many teams will now have to ask themselves if it worthwhile giving players such as Camilio, Giles Barnes, Aurelien Collin or Sebastien Le Toux DP contracts as well based on their performances in the league. Even if the answer is yes, when the Beckham rule came into effect this isn't what the league had in mind. There are similar concerns regarding the Generation Adidas and Home Grown player contracts that the league gives out and encourages teams to sign, as they don't count against the salary cap. The main reason contracts are given to GA and HGP is to protect the league’s interest in the value of young players, although currently the only success stories of GA players being sold for large profit are Clint Dempsey, Michael Parkhurst, Jozy Altidore, Sacha Kljestan, Maurice Edu, Brek Shea and Omar Gonzalez. These are players who were US National Youth Team players during their GA status and have remained in the Senior National team discussion. There is also a large list of GA's, who since playing in MLS, have struggled to make an impact in the league and because of this they are no longer in a national team picture. If the DP, and in many ways the GA, is an unsustainable system what can the league do to improve it? My suggestion would be to create a system that can both reward the future development of the league as well as the national team by having American and Canadian internationals at all levels who play in the MLS provide their team with a significant salary cap break. The idea would be if a player has played for the either the Canadian and United States Senior National team the season before, they would only count at the league average salary or around $150,000 against the cap. A player who played for a U-17, U-21 or U-23 the season before, that player would be the equivalent to the current off-budget players (GA, HGP) and would not count against the salary cap at all. This means current MLS teams would get Salary cap relief for current US international playing in the league such as Nick Rimando, Klye Beckerman, Brad Davis, Graham Zusi, and Eddie Johnson. Canadian Internationals Will Johnson, Patrice Bernier and Dwayne De Rosario, and their teams, could also pay these players fair salaries similar to Gonzalez and Wondolowski’s new DP contracts. It would also encourage MLS teams to sign internationals playing abroad for a competitive salary such as Alejandro Bedoya or Olivier Occean, as well as signing national team players who currently don't have a club. This would also encourage MLS teams to break the bank on big name players who I think will have a greater impact in MLS since they will be playing both for the local team as well as the national team, as seen with the recent hype around the Clint Dempsey signing by Seattle. This initiative would also encourage MLS teams in signing and developing youth players for the national team, which might influence most youth nationals to play in MLS oppose to starting their career elsewhere, which has been a bigger issue than most realize. For example, in the last U-20 CONCACAF tournament the United States had seven players not signed to an MLS club, while Canada had eleven. At the U-23 2012 CONCACAF Men's Olympic Qualifying Tournament, the United States had six players and Canada had nine, including Nana Attakora, Philippe Davies and Carl Haworth, who were all unattached from any club team. If the player is dropped or retired from the national team his salary would count against the cap the following season. This would answer some of the critics who have complained about MLS teams signing high profile players based on name and not performance. The system would also put expectations on the player to maintain their place within the national team setup and could also encourage MLS clubs to play local based players since it benefits the club having this player in their squad. It should also improve the competitiveness and overall quality of the national teams as players will have an additional carrot of a more lucrative MLS contract. MLS will also benefit, since the most high profile team in North America is the US National Team and international interest and value from the outside soccer world is more based on how players perform internationally opposed to MLS. If MLS wishes to sell prospects to Europe, there should be a larger amount of players to choose from. Finally, it could encourage multi-international players to sign with Canada and the United States national team because an MLS team could offer the player a higher entry level contract than what is offered in Europe and continually give the player an MLS option throughout his career as long as he plays on the National Team. In most countries outside of the EU there are restrictions on how many foreign players can play in the league, with many adapting a maximum of three per club. Currently 44% of players in MLS are not from Canada or the United States. In comparison, the other CONCACAF powerhouse Mexico is at 21%, which means the Mexican national team has over 200 players more to choose from in it’s domestic top division. For Canada there are currently 16 players signed with MLS teams, so it’s not difficult to see why there has been so many struggles with such a small pool to choose from. One last detail is that under my suggestion it wouldn't mean the end of foreign players in MLS and these clubs could potentially have more salary cap room based on how well they use this new system. MLS has tried to make the shift to no longer being a retirement league for foreign internationals at the end of their career, and MLS clubs have realized that signing a Hristo Stoichkov, Roberto Donadoni or Lothar Matthaus doesn't mean success on and off the pitch. The alternative has been to bring in Europan based players out of contract or South American players within the league’s budget constraints. In my opinion this system has holes as well and doesn't help the long term product. MLS should realize that the most successful soccer story over the last ten years in North America has been an interest in the US National team with record attendance and television ratings. It is time for MLS to take advantage of this and begin highlighting both the Canadian and American-born national team player and showcase that we have other assets to provide the global soccer World other than wasted money.